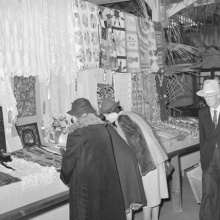 Russell Lee, Women looking at quilting and crocheting exhibit at Gonzalez County Fair. Gonzales, Texas, November 1939. Library of Congress, Prints & Photographs Division, Washington, D.C.
“Home-Made Quilts of U.S. 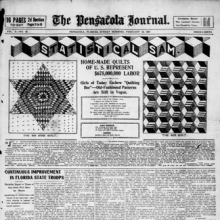 Represent $675,000,000 in Labor.” The Pensacola Journal. February 24, 1907. 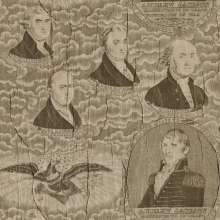 Library of Congress, Chronicling America, Washington, D.C.
By choosing symbolic fabrics, such as this cotton print featuring portraits of the first seven U.S. presidents, women used quilts as a way to voice their political positions. The fabric used here suggests a date for this unique whole-cloth quilt: as only the initial year of Andrew Jackson’s first term is included, the fabric was presumably printed while he was in office, between 1829 and 1837. The laudatory phrase below Jackson’s image, “Magnanimous in Peace, Victorious in War,” implies that this quilt’s maker was a supporter of the contentious president. Employing skillful color variations and similar block patterns in the interior and border, this quilt was clearly a point of pride for its maker. 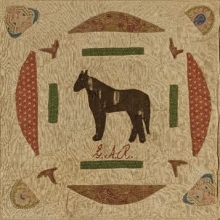 The label on the reverse reads, “Box and Star Pattern, Quilt made by Mrs. Victoria Royall Broadhead in 1865 to 1870 in Columbia, Mo.,” and lists state fairs in two cities (Saint Louis and Kansas City) where the quilt received the first premium, and others (Columbia and Mexico, Missouri) where it was exhibited. Each block of this quilt showcases the diverse skills and interests of a different contributor. One features a woman’s silhouette, the initials “N. M.,” a cat, a heart, a mitten, and the square and compass symbol of the Freemason fraternal organization. Though they were not allowed membership, women supported this all-male group through female auxiliaries, using their needles to raise money and awareness for Mason causes. 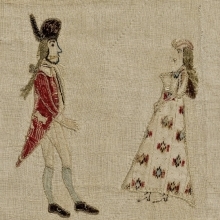 This spirited quilt illustrates life in England or Ireland in the late eighteenth century. Using a combination of cotton printed fabrics and embroidery, the unknown quilter created mirrored scenes of village and country life on the outer border, and showed elaborately dressed couples engaged in conversation or dancing along the inner ring. 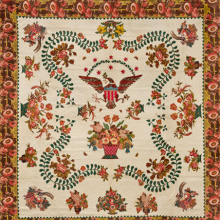 The multiple borders and stylized floral cartouches are common elements in quilts from this region and time period, but the vignettes offer the maker’s own perspective on the world. Amish quilts are a unique subgenre in the field. 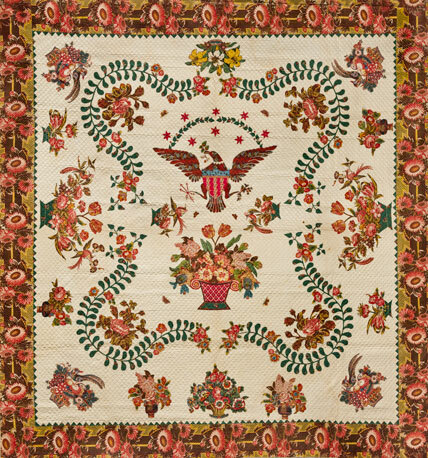 Expected to show restraint in their pieced quilts, Amish women avoided printed and synthetic textiles as well as the intricate appliqué designs seen in mainstream quilt-making, favoring overall large-scale patterns and richly saturated monochromatic fabrics, often juxtaposed in unusual combinations. They did, however, lavish time and energy on the stitched designs used to hold the layers of a quilt together. 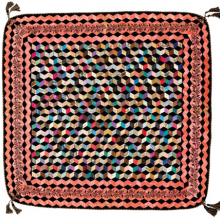 The result is bold geometric designs that make Amish quilts seem modern in spirit. In fact, early proponents of American modernism were drawn to folk art, including quilt-making, and participated in a revival of interest in the material in the 1920s and 1930s. 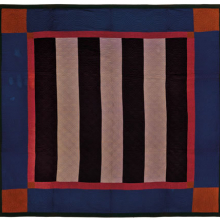 By the 1970s it was common to compare Amish and other more minimalist quilts to the work of Color Field painters such as Barnett Newman, Mark Rothko, and Jules Olitski, most famously in the Whitney Museum’s 1971 exhibition Abstract Design in American Quilts. Those artists produced remarkable variations on vibrant and flat abstractions, and Amish quilts can likewise be seen as experiments in color and scale within a limited range of patterns. 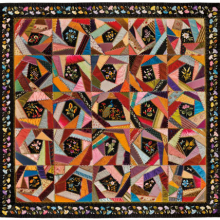 An exquisitely embroidered naturalistic flower, highlighted against a black background, appears in the center of each block in this structured crazy quilt. The satin stitch Mary Stinson used provides color gradations and texture that give her floral creations a three-dimensional quality and put her exceptional skills on full display. She framed the quilt with the same dramatic black silk used for its background, emphasizing the ordered composition underlining its crazy quilt style, as well as the incredible variety of stitching techniques found on its surface. “Workt by Hand”: Hidden Labor and Historical Quilts showcases approximately thirty-five American and European quilt masterpieces from the Brooklyn Museum’s renowned decorative arts collection. The exhibition examines the impact of feminist scholarship on the ways historical quilts have been and are currently viewed, contextualized, and interpreted. 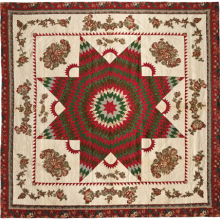 Spanning two centuries of quilt making, the exhibition features superlative examples of the most iconic quilt designs and techniques, including the “Barn Raising” or “Log Cabin” style, the “Garden Basket” style, “Double Wedding Band” designs, the “Rose of Sharon” pattern, and the Amish “Sunshine and Shadow” style, as well as a variety of album quilts. The exhibition considers how issues common to the craft and handmade nature of quilting practices, such as anonymity, authorship, and collectivity, have affected the interpretation and reception of quilts. It also examines the historical designation of quilts as crafts rather than art objects and the shift in the late twentieth century, under the influence of modernism, toward a formalist appreciation of quilts as works of abstract art. This shift, and its implications for the way quilts have been seen and understood, will be explored by the quilts being presented both vertically—as they are now frequently shown in museums and galleries—and horizontally, as though on the beds for which they were originally designed. “Workt by Hand”: Hidden Labor and Historical Quilts is organized by Catherine Morris, Curator of the Elizabeth A. Sackler Center for Feminist Art, Brooklyn Museum.